You sound a lot like me. My 'go to' printer is still the 2020 i3 because it just keeps going! I have the FT5 to with the BLTOUCH, E3D, and the Titan. It also runs well but I've used it mainly to run parts that I need multiples of for orders. I made a few things that required the height given by the FT5 but mostly groups of parts. The one advantage I like with the RC8 is that it lets you reset and test the BLTOUCH right from the LCD screen. It also does mesh bed leveling for uneven glass surfaces like the borosilicate glass I use. I manually leveled for a long time but I succombed to the lure of another 'gadget', the BLTOUCH, and haven't looked back. No more leveling at all now. Plus, the real downside of the FT5 is the crappy bed so the BLTOUCH solved that problem plus I only use 3 points, as you should, to level the bed close enough. The BLTOUCH has been a real saver on the FT-5 because I have a thermal problem. The room that I have the printer in is not always heated so in the morning when things are cold I need to adjust the X-offset and as it warms up I keep having to adjust it in small amounts at the start of a new print for an hour or so. Once everything is warmed up it is stable, so its just as its warming up. I do have a full enclosure which helps it warm up quicker. For a printing surface I use the 12x12 mirrors from Lowe's but with the E3D and the 30W heater it takes a little while for it to warm up. I found that I can go to 4 (actually 16) sampling for the bed level and that is just about the right amount of time to let the hot end heat up. The other thing I added is the 280W bed heater so I can get things heated up a lot quicker. But the most important things things is when I break something I go back to the 2020 i3 to print what I need to get things going again. Has anyone tried marlin 1.1.0 rc8 on their 2020 yet? Just wonder how your display looked after the update.the attached photo is how mine turned out. I just install bltouch on mine last night and decide to try out rc8 for the bltouch support. Just wondering is i missed a setting some where to for the display? I recently downloaded 1.1.0 RC8 on my 2020 i3 and I have the normal screen. I also have the BLTOUCH installed for the last year or more. No problems. I suggest you try to download the ENTIRE RC8 again and install it all again. Maybe you somehow selected the wrong display. Edited 1 time(s). Last edit at 01/23/2017 03:51PM by tjnamtiw. Thank you for your assistant tjnamtiw! if you don't mind me asking, does the following selection look right for the BLTouch for RC8. Noticed the instructions that came with mine are for RC7 and the wiki page is rc3. Leaves me wondering about my z axis, if i have a driver issue or a setting set incorrectly. // Probes are sensors/switches that are activated / deactivated before/after use. // Allen Key Probes, Servo Probes, Z-Sled Probes, FIX_MOUNTED_PROBE, etc. // You must activate one of these to use Auto Bed Leveling below. // Use M851 to set the Z probe vertical offset from the nozzle. Store with M500. // A Fix-Mounted Probe either doesn't deploy or needs manual deployment. // For example an inductive probe, or a setup that uses the nozzle to probe. // its trigger-point if hardware endstops are active. // The BLTouch probe emulates a servo probe. // The default connector is SERVO 0. Set Z_ENDSTOP_SERVO_NR below to override. // Z Servo Probe, such as an endstop switch on a rotating arm. // Enable if you have a Z probe mounted on a sled like those designed by Charles Bell. //#define SLED_DOCKING_OFFSET 5 // The extra distance the X axis must travel to pickup the sled. 0 should be fine but you can push it further if you'd like. // Z Probe to nozzle (X,Y) offset, relative to (0, 0). // X and Y offsets must be integers. // Allen Key Probe is defined in the Delta example configurations. // To continue using the Z-min-endstop for homing, be sure to disable Z_SAFE_HOMING. // Example: To park the head outside the bed area when homing with G28. // To use a separate Z probe, your board must define a Z_MIN_PROBE_PIN. // NUM_SERVOS, Z_ENDSTOP_SERVO_NR and Z_SERVO_ANGLES. // - RAMPS 1.3/1.4 boards may be able to use the 5V, GND, and Aux4->D32 pin. // - Use 5V for powered (usu. inductive) sensors. //   - normally-closed switches to GND and D32. //   - normally-open switches to 5V and D32. // Normally-closed switches are advised and are the default. // default pin for all RAMPS-based boards. Most boards use the X_MAX_PIN by default. // To use a different pin you can override it here. // Setting the wrong pin may have unexpected and potentially disastrous consequences. // Use with caution and do your homework. // Enable Z_MIN_PROBE_ENDSTOP to use _both_ a Z Probe and a Z-min-endstop on the same machine. // With this option the Z_MIN_PROBE_PIN will only be used for probing, never for homing. // Enable Z_MIN_PROBE_USES_Z_MIN_ENDSTOP_PIN to use the Z_MIN_PIN for your Z_MIN_PROBE. // The Z_MIN_PIN will then be used for both Z-homing and probing. // To use a probe you must enable one of the two options above! * probe points to avoid hitting the bed and other hardware. * Servo-mounted probes require extra space for the arm to rotate. * Inductive probes need space to keep from triggering early. * probe Z Offset set with Z_PROBE_OFFSET_FROM_EXTRUDER, M851, or the LCD. * Only integer values >= 1 are valid here. * Example: `M851 Z-5` with a CLEARANCE of 4  =>  9mm from bed to nozzle. *     But: `M851 Z+1` with a CLEARANCE of 2  =>  2mm from bed to nozzle. // Disables axis stepper immediately when it's not being used. // WARNING: When motors turn off there is a chance of losing position accuracy! Edited 1 time(s). Last edit at 01/24/2017 01:41PM by Mopar99. You should turn on line numbering in Marlin to make it easier to comment back. Of course, first you must define your x,y, and z_PROBE_OFFSET_FROM_EXTRUDER. and increase #define Z_PROBE_SPEED_SLOW (Z_PROBE_SPEED_FAST / 2) to /5 so the second probe is slower and more precise. When I went to go check on my little darling, it was just sitting there. My computer was still pushing g-code to it, but the printer was not operating. All of the USB powered functions appear to behave normally. While the fan for the extruder runs when power is given to the printer (but it bypasses the ramps board), none of the other 12v functions work. I figured this means one of those big nasty fuses was blown; I used a multimeter, attached one end to a ground, and the other end to both sides of both of the big yellow fuses (one at a time, of course), this reads 12-ish at each location... So, not the fuses. Edited 1 time(s). Last edit at 01/25/2017 08:19PM by Colt4D5. When checking the fuses measure DC voltage across them. If you read 12 volts, they are blown. If you read 0, they are OK. Both fuses measure 0 across them. So I got my FT 2020 i3 built and printing; however I do have a couple of issues that I am unsuccessful so far in resolving. 1. It prints in a mirrored fashion. Meaning the resulting print is that exact mirror of what the original is. I can resolve this in the Repitier Host by selecting the "mirror" button, but really would like to permanently fix it. I did some searching and found some suggestions, but no luck so far. I still have more research to do on that. 2. The more important issue that I would like to resolve is the print size. I printed the 20mm test block and the sizes are all off on all axis's. (as well as being a bit distorted on the top x-axis) I have tried adjusting the bed and nozzle temperatures as well as used different brands of filament, but no luck. This is my first experience with 3d printing so I apologize if what I ask is basic, but I have had no luck so far and am reaching out for suggestions. First some pictures of the print would be helpful to diagnose the issues. What firmware are you running? The beta or the orginal? The print size can be a few things. From the e steps not calibrated correctly. Z steps also. And extrusion not calibrated right. Have you calibrated all of these? The FT settings are an ok place to start but not the final say. And do you have a cooling fan for the part while printing? The second print's X and Y axis actually measures much better, but the Z axis in about 2mm short. I will look at what it takes to calibrate the 'e' steps next and try that. I created a tube (think straw) for a project that I am working on and the diameter is way off. I tried this couple of different ways: nozzle/bed heat , created in mm/in - setting the appropriate size setting on the Repitier and even checking it in another program (name escapes me). Tonight I will try another square print and circle print to see how mush it's off.. any input is more than welcome! Holes are ALWAYS smaller because they aren't circles, but a group of connected lines. When you design something, make the holes at least 10% bigger. Experiment and see what % works for you. Some experiments I did on hole size a while back: [moosteria.blogspot.com]. I bought one about a year ago used pre-built from a friend. Since then I've beat the hell out of it printing around the clock and it still runs good. Project at hand is a Chimera mixing head. How do I go about setting up the firmware to read two motors, one heater, one temp probe? I think I see what I have to do, but considering how well this machine has run I don't want to "blow it up" even metaphorically. Assume that I have access to tools, the Arduino programming environment, the basic stock Folgertech Firmware that they have on Google Drive and that I can follow basic directions. #1 Why is the Z carriage under the 3rd stepper driver plugged in backwards? #2 Step 21-2 picture shows Black + Red - but reads Black - Red + which is correct? #3 I am using the Full LCD so the firmware updater i use is FT-2020 Full LCD correct? #5 I get a Fatal Error on Connect, Extruder switched off MaxTemp triggerered and I cannot get it cleared. I have checked all wiring it is wired correctly. any help to any question is greatly appreciated. #4 Depends on where you go your Marlin files from? Thats all the answer i can provide you at the moment. maybe someone else can answer the others? #5 is probably a shorted Thermistor for the hotend. So i have my BLtouch functioning somewhat now....Question now is what should the startup script look like? #1 Ok I have my FT 2020 built, I can move all axis using the LCD controller. I can home/control all axis in Repetier. I slice and print and nothing happens. I can see it sending the gcode but nothing ever moves. My extruder heats up fine. My heated bed will only heat up to 35C. But even if I lower the heat temp to under 35C nothing moves. I have checked my stepper drivers and they are at the correct voltage. Is there a sketch that I can use to move the extruder on all its axis using the arrow keys. I cant tell if its not working because of my heated bed error or something else. Is there something i am missing? Any help is appreciated. #2 Is there a way to wire up the Heated Bed so that if something goes wrong it doesnt fry my Ramps board? Can I power the bed externally with its own 12v power supply? I have an acrylic FolgerTech i3. I am looking for a better design for the y idler. Currently using 623zz with plastic housing but it wobbles too much. Folks - 3d printer novice here. I just finished my 2020. It went together OK, some things I thought were silly, like why does the hot plate have to go on so early? And if the distance between the X-axis parts is supposed to be 300mm and this is a critical distance, why don't the bores in the end pieces set that? Mine had little resistance, so the distance is pretty much set by the belt tension. Why is there no screw adjustment for the Z-axis limit switch? Reading over the pages of this thread has confused me as to what firmware/software I should be loading the arduino up with. I have the graphic display. Can someone point me to the best version as it stands right now? On the Google drive link for the Folgertech 2020, under Beta Firmware there is a zip file titled FT-2020-FULL_LCD, unzip this to your pc.There will be a file called FT_2020_FULL_LCD.ino , double click this, it will open in Arduino IDE. Choose your board and COM port and upload. That is all. Close Arduino IDE your LCD will reboot with the Folgertech menu. Next proceed to Repetier for more difficult configurations. I hope this helps. Edited 2 time(s). Last edit at 02/15/2017 05:24PM by RanchoMattPS. OK - will do. Thanks, Matt! get some time under your belt, then you can start tinkering with setting in marlin. therippa's version you'll have to move you x endstop to the left side of the printer. I think folgertech is RC2 and therippa is rc3. marlin is on rc8 currently. 1.) When I run M119 my Y_max endstop shows Triggered 2.) None of my axis will move more than half way and Y-axis will move in one direction but not the other. Issues I've had and resolved: 1.) Motors moving in the wrong direction - Reversed the plug for the steppers on the Ramps Board. 2.) Had my x & Y endstops wired backwards x where Y should be and vice versa. I've tried finding a basic setup the firmware tutorial but so far I'm unsuccessful. Any advice will be appreciated. 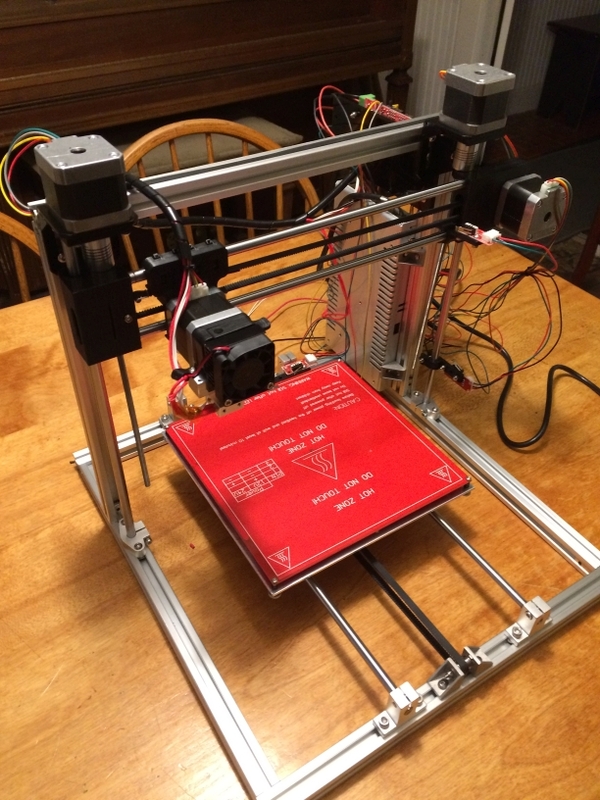 I would suggest looking at the link below, Marlin just made some update and add our printer to the example setup in the RC-8 RCBugFix. Thanks but I can't get RC-8 to compile and running a Release Candidate may be out of my league. I'd like to get the printer up and running on stable before I start going bleeding edge. Thanks again. 1) have you tried inverting the setting in the config to see if that changes the status. 2) I used to have to hit home all before i could start moving my axis. or atleast the x & y. What software are you using to control your printer. you may want to try the FB group for help, there is a folgertech group. this thread has somewhat died. base on the source of firmware you've tried, i would still urge you to get a fresh copy of marlin to work with. the folgertech version is old and therippa version you have to match his setup. So I figured out my issues. First I had to move the x-axis endstop to the left side so that it is a MIN type as well as the others. Also I hadn't taken into account that I am using 1/32 drivers so none of my step settings were correct. Now to learn how to level the bed and start melting some plastic. Thanks for your help @mopar99 I agree now that I've figured out these issues I am going to look at running a "current" version of Marlin. First I had to move the x-axis endstop to the left side so that it is a MIN type as well as the others. Edited 1 time(s). Last edit at 04/01/2017 08:42PM by VonRansak. Thanks everybody for the advice before. Got everything together and ready to go. When I tried printing out the 5mm calibration steps everything seems to go great. Printer homes, Bed heats up, Extruder starts to heat gets to 80c and then just stops heating. I tried printing from repeteir as well as SD card and same behavior. When I manually turn on the extruder heater it comes up to temp just fine and holds there for as long as I like. I don't get any error messages back to the console. I did notice that when I tried printing off the SD card without it plugged into my computer that the whole thing rebooted. I've also tried manually heating both the extruder and the heated bed at the same time seeing if it was a power supply issue. and they both will stay on for more than 10 min.